How heartening to see such a big turnout on Friday night for the final Gala Concert of the 2013 Montreal International Musical Competition! 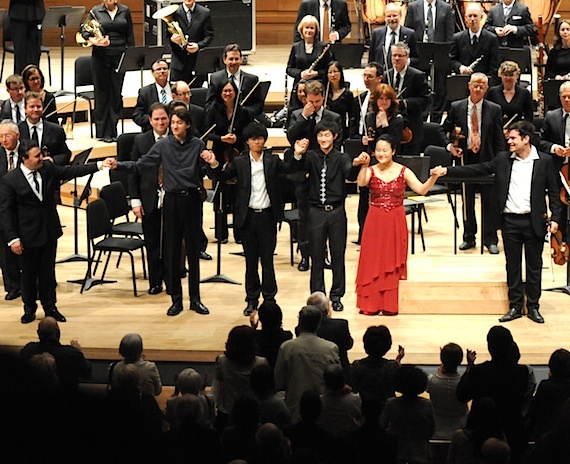 The three laureates -- Marc Bouchkov (first prize), Stephen Waarts (second prize) and Zeyu Victor Li (third prize) -- and three remaining finalists -- Fédor Roudine, Ji Young Lim and Chi Li -- played to a nearly-full house at the Maison Symphonique de Montréal. Above, I have linked the performers' names to their semi-final performances, because I do believe the semi-finals truly showcased their emerging artistry, and in many cases they gave truly stunning performances. This final concert -- well, it was a bit more like those final Olympic figure skating exhibition galas, when the competition is over, the athletes are exhausted, and nobody is making their triple-lutz jumps any more. Maxim Vengerov finally did get to conduct something besides the Tchaikovsky Concerto, with Chi Li playing the last movement of the Mendelssohn, Ji Young Lim playing Saint-Saens "Introduction and Rondo Capriccioso," Zeyu Victor Li playing Ravel's Tzigane and Marc Bouchkov playing Sibelius Concerto. Fedor Roudine reprised his last movement of the Tchaikovsky and Stephen Waarts, the first movement of the Brahms. Thank you for the nice blog and competition covers!